A little bit of shoulder adds a flirty touch, making this the perfect going out top. 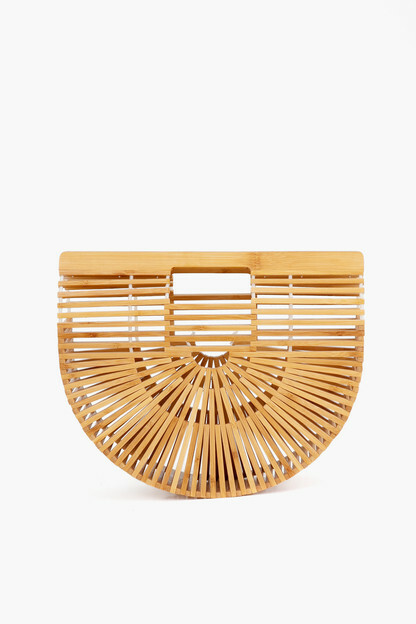 Pair with heels and a fun clutch for a look that will make you feel great! Stunning top, it’s a must have! This top is one of my new favorites! Purchased in white, and planning on getting in another color! I received so many compliments and everyone wanted to know where it was from. I typically always order XS-S and went with the small, the fit was perfect and wasn’t see through. I highly recommend this top! Love this top! Received so many compliments when I wore it. Not sheer at all but very lightweight and comfortable. 5’5 125 lbs and ordered Small. Perfect fit. I absolutely love this top! I do feel it is a bit boxier than what I had expected, and a bit shorter but with skinny jeans and/or with the front tucked into a pair of shorts it still is very cute. If I could I would have this is every color! For sizing, I’m 5’4’’, 110 pounds, 32b and purchased an XS. I would recommend sizing down since it is boxier, but I could also see sizing up one for the length. This top is so cute and easy to slip on for a night out or brunch! I got an XS and it was true to size. I wore it to dinner the same day I got it in the mail! This top is a great addition to my closet - I can see myself wearing it so often! It look perfect with regular jeans, white jeans, nice pants, or even skirts. I'm normally an X-Small, and the fit was great. I was able to move my arms without the shirt moving all the way up to my throat! 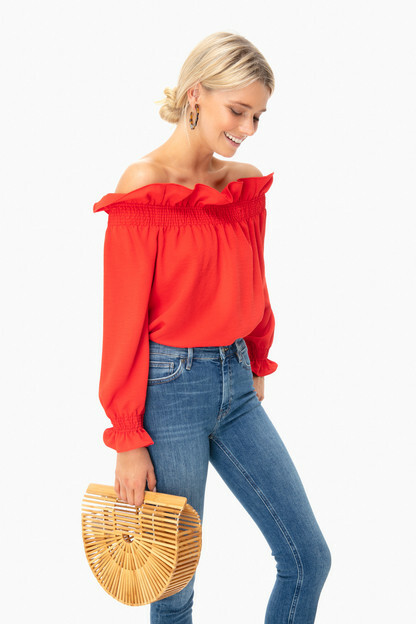 Perfect off the shoulder top! Not too sheer and long enough to not show any midriff while wearing pants or skirts. The material is perfect for spring into summer. This will be my go to spring shirt! So flirty, fun and flattering! Ordered the white and the blue! A really classic, beautiful top. If you're bustier, there's a chance you'll have to pull the sleeves down often to get it to stay off the shoulder, but tucking it in to a pair of pants or a skirt should fix that. Sleeves are a perfect length and you can wear them long or bunch them up. I can wear this so many ways and for so many occasions! It’s the perfect shirt and a great price point! I love the look and feel of this blouse, unfortunately it didn't love me back. I was too short and boxy...it would have fit me better if had been a slimmer width and a few inches longer. Sadly, will have to return. This blouse is absolutely gorgeous. I purchased for a work top, and its professional and sweet without being risque. it looks like it would be a little thick and stiff, but it's extremely comfortable. Also wonderful for tucking in and wearing a belt! Such a cute top- perfect for a party or dinner/drinks out! I love this Blouse! It’s super cute and the material is very nice and feels expensive! This top fits true to size. The fabric is great quality and can dress this up or down. Looking forward to wearing it for upcoming holiday parties! Gorgeous blouse, a bit boxy/large, very pretty ruffled off the shoulder detail. Color and fabric are absolutely perfect! Love this top! It’s thick material, so hides your imperfections. If in between sizes, I would size down. But this is the perfect top! I love this! The material is thicker than I expected and the color is rich! Super pleased! So excited about this little gem! Will be my “go to” holiday top this season. The green is the perfect shade and looks amazing with leather pants! Don’t pass this one up! Preferred the medium for the added length. This will be my new go to for the fall and the holidays. The top is so flattering and very comfortable. The color is absolutely gorgeous and will work well all through fall and winter. I’m so excited for this purchase! Getting my mojo back with this top! I love the beautiful green color of this top! It fits perfect on my shoulders, (not falling too low and inappropriate like some off the shoulders can be). Tasteful, classy and a little bit sassy! Love the color and fit! Perfect for fall and the holidays! Perfect with jeans or black pants to dress it up! This top is even more beautiful in person. The fit is perfect and the color is stunning. It's a thick, quality fabric. The elastic around the shoulders doesn't shift as you walk or talk. It's a great piece! Fabric wasn’t what I expected but it’s super cute anyways! Fabric wasn’t as I expected but still is super cute! This is the top that you can wear all throughout the holidays. I love it untucked with skinny jeans or pixie pants and half tucked into cropped wide leg pants with heels. It shows just the right amount of skin while the ruffle neckline and sleeves are very festive. Highly recommend! I love this shirt! I am 5’10 and the extra small fits fine but my arms are just a bit long so the sleeves are slightly short. Other than that, I love the top! Wanted to love it, but it was sadly too short for me. This is a high quality top & brilliant color. Unfortunately I had to return it as it was just a little too short for my body. SO cute! I bought it black a few months back and wore it to everything this winter. When the red came in, I HAD to have it!!! Absolutely love this top! Very flattering and the perfect shade of red! 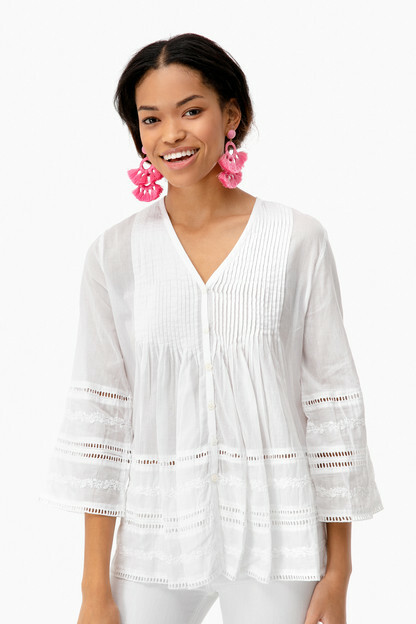 Ok this top is just darling. I love that the fabric has a little bit of weight to it. It drapes so nicely. It is cute with a little front tuck or left out. I originally wanted the black but as it was sold out I ended up with the red, which is the perfect orangey-red. I got it to wear in Rome but ended up wearing before that to a neighborhood event and it was a hit! I am 5’9” 180 and went with the large. If I had one complaint I would say that I wish it was about an inch longer- I have a long torso and would have loved that extra inch! But it still works all the same! My go-to going out top now! I absolutely love this top. It is really comfortable and easy to throw on with jeans and could pair with skirt or shorts when the weather warms up. So cute - fit great! Looks just like it does in the picture. The fabric is nice and thick, and the length is perfect. This top is great to wear for a day date or evening out. It has a nice weight to it so it drapes well. It is a slightly oversized fit; if worn tucked in you don't notice. Love this shirt. So comfortable and stayed put all night. No readjusting needed. Such a great date night top! I was very impressed with this top. The quality of the material was heavier than I anticipated but made it well worth the money. It’s so fun to wear! This is the most comfortable and chic top! It looks great with jeans or back pants. I love it! This is beautiful color blue! I wish they offered dress in the same color as this shirt. Beautiful color and amazing fit! I love this top so much that I have it in three colors! It's perfect to wear with jeans and flats or dress it up with slim pants and heels! I also wear them with either big earrings and no necklace or studs and long necklace.